Hello. My name is Brenda. And I’m a condimentaholic. I’m not afraid or embarrassed to admit it. And I honestly don’t want any help in curing this delicious affliction! I LOVE condiments in every form…dips, sauces, salsas, relishes…you name it. Especially when they are whipped up from scratch, made from fresh ingredients that let the seasons shine. 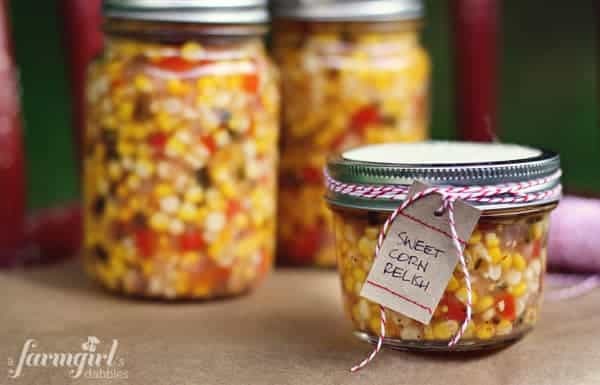 This Zesty Sweet Corn Refrigerator Relish is one such condiment, bursting with late summer’s harvest. I like to make this fresh relish when the local sweet corn starts showing up at the farmers markets and roadside stands. We hit the jackpot when visiting family in Lake City (MN) a couple weeks ago, when my cousin’s wife recommended a particular roadside vendor. Out of his rusty blue Chevy truck, this vendor was selling sweet corn that was just harvested during the night. And lucky me, it was my favorite sweet and tender “peaches and cream” bi-color variety, the kind Dad grew on the farm. When we got home, I toted my dozen ears to the deck in the back yard. It’s my preferred place to husk corn, to keep the mess out of the kitchen. I just drop all the husks and silk into an upright brown paper bag, and then back to the kitchen I go. 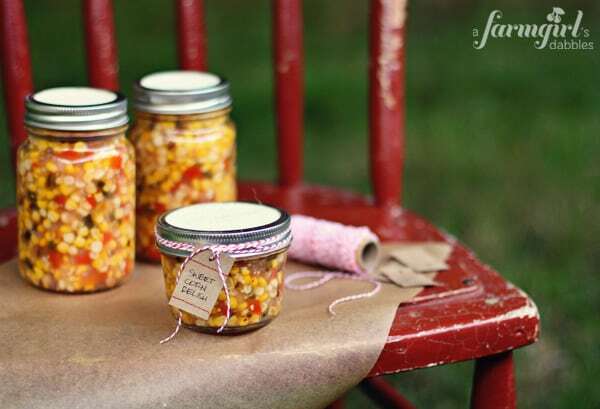 This sweet corn relish captures summer with simple refrigerator preservation. No hot water bath processing involved. The relish stays crisp and fresh and utterly irresistible stored in the refrigerator for 3 months or so. But it truly never lasts that long around here. I expect that I’ll actually make a couple more batches before summer is over, as our girls have just discovered how much they like it, too. We sat down to grilled quesadillas this past week, topped with sweet corn relish, and nearly finished off a whole jar in one sitting! If you have a bunch of cucumbers, you’ll also want to check out the recipe for my Mom’s Refrigerator Sweet Pickles! I like to serve sweet corn relish with any meal that has a Mexican twist. With carnitas or my favorite grilled chicken salad, or simply with tortilla chips to scoop up all those tender tangy kernels. It also shines at the breakfast table, atop fried eggs and slices of creamy avocado. A couple notes about the sweet corn: Only use the freshest, most tender sweet corn you can find. I learned the hard way that an ear or two of tough or mushy corn can ruin the whole batch. I test every ear I cut now! Also take care to not over cook the corn on the cob. After adding the corn to boiling water, and after the water returns to a boil, only cook the ears for about 3 minutes. Then cool immediately in cold water. In a large bowl, combine the corn, red pepper, onion, and poblano pepper. Set aside. In a large pot, combine the vinegar, sugar, mustard seed, cumin, coriander seed, celery seed, crushed red pepper, salt, and black pepper. Bring to a boil over medium-high heat, then add the corn mixture. Return to a boil and then reduce heat to low. Simmer uncovered for 15 minutes. Spoon off any accumulated foam. Stir together the water and cornstarch and then stir it into the corn mixture. Turn heat up to medium and cook for 5 minutes, or until mixture starts to thicken, stirring occasionally. Ladle into 4 pint or 8 half-pint sterilized canning jars. Cover jars with lids and screw on the bands. Let cool to room temperature and then refrigerate for up to 3 months. 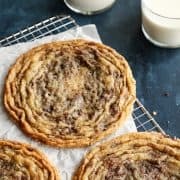 I know this is an older post, but I wanted to thank you for the recipe. A year or so ago my husband and I found something on sale at a grocery store and we never found it again so we weren’t sure if it was corn salsa or corn relish. I’m pretty sure now it was corn relish. Can’t wait to make some more! We were putting it on everything before and loved it so much! Wonderful! 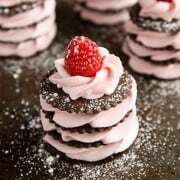 Thank you for your comment – I LOVE this older recipe. Enjoy!! Hi there! 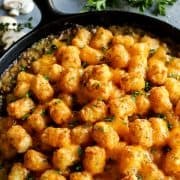 Definitely going to try this, as bodacious corn is in season! My favorite way to use this corn in the past is to make a chowder, and freeze batches and batches for the future. I can share the recipe if you’d like. Hi Brenda! You are from Lake City MN???? I was born and raised here in the Birthplace of Waterskiing! My husband and I still live and work here and have raised our 3 daughters here. I work as a School Nurse at Lincoln High…did you graduate from here? I saw the link to your blog on the Pioneer Womans site and thought I would take a look! 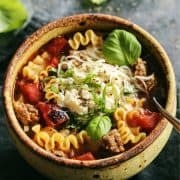 Loving your recipes! 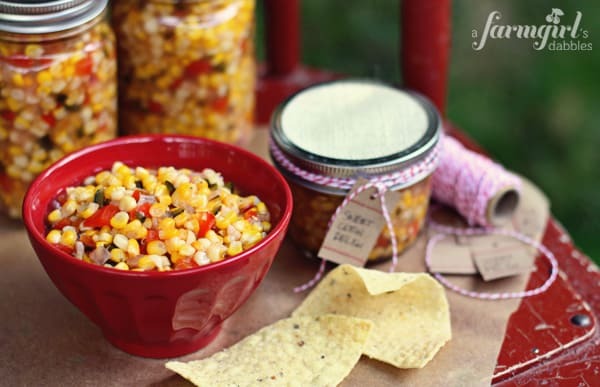 I have made corn relish in the past, but it has never had the zesty kick of this recipe. This will be gone in no time. Thanks for the recipe! Made a 5x batch after putting up 100 bags of fresh sweet corn. Hot bathed 20 jars put two in the fridge. It’s awesome thank you!!! Last summer my family froze sweet corn by blanching and cutting off the cob. 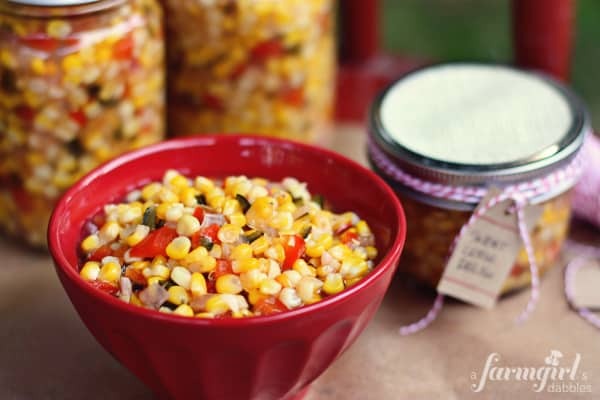 Do you think it’s worth a try to make this relish using frozen farm fresh sweet corn? Thanks, this looks like a great recipie. 4 months after canning and the relish is still crispy. I caught a terrible cold before Christmas and was so glad to have enough relish for neighbor presents. Got rave reviews from everybody! No need to reply, just wanted you to know! 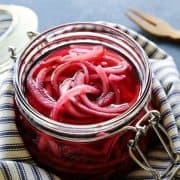 Love this relish, thank you for the recipe! I canned this and to no detriment that I can tell. 15 minute hot water bath for the pints, 10 for the 12 oz. jars, and 8 for the 8 oz. jars. Relish kept its crunch, too. I’d have refrigerated all the jars, but I have too many condiments in the fridge, so no room there–HA! Pingback: Sweet Corn Salad with Seared Sea Scallops | Never Enough Thyme — Never Enough Thyme - Recipes with a slight southern accent. Wow, uber easy!! Didn’t have red pepper so headed out into the garden and found some Aruba peppers and gypsy peppers, not as colorful but very yummy! Trying the curry cauliflower today…. Yay! 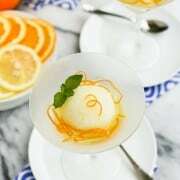 This recipe is one of my very favorite summer recipes. Enjoy!! I luckily stumbled across your blog! I love your recipe for corn relish, but being a single, doing a refrigerated corn relish isn’t my preferred method. I like to can & make gift baskets & contribute to rescue fundraisers, so my question is….Can I hot water bath your recipe & if so for how long please? I have not processed this in a water bath, Shawn. You can always consult Ball online for processing times = http://www.freshpreserving.com/recipe.aspx?r=79 = the corn relish recipe on the Ball site says to process in a hot water bath for 15 minutes. Thanks for this wonderful recipe. We made two batches this year. Our sweet corn was really sweet, so we reduced the sugar on the second batch. I brought a jar to the New Effington Elementary school and my fellow teachers liked the new batch. I really enjoy your site. I have tried many of your recipes. This is great stuff, I thought I’d give some away after I made it but I have changed my mind. Such a good combination of sweet/sour . Thanks!! 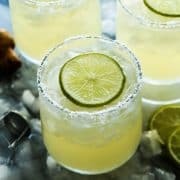 Thanks soooo much for making it easy to print your recipes! I save recipes to my computer but also like hard copies. I used to work at a restaurant that had a relish like this on the salad bar. Can’t wait to make it. I hope you like this relish, Beth – please let me know! Oh that’s gorgeous! I love preserving summer’s bounty! Hahahahahaha, condimentaholic! You make me lol! I cannot say it enough how much I adore your blog. It’s beautiful and delicious, an the photos amaze me every time! So fresh! Love this relish! Thank you, Maria – I have 1 jar left, saving it for a dinner party this weekend. I need to make some more! 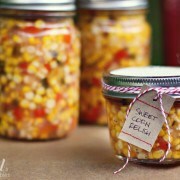 This corn relish looks so yummy. From the looks of my fridge you must have inherited that ‘condition’ from me! You’re a total crack up! My name is Julia, and I’m a condimentaholic too! I love making condiments from scratch and unfortunately, I haven’t gone through the process of canning large batches yet. I love your corn relish and enjoy the fact that I can make it and have it for months and months! Every night at dinner, I layout the condiments on the table, whether or not they actually go with the meal. Need to make some corn relish to add to the mix! I know what you mean about bringing out all the condiments. I have to try to hold myself back sometimes, because it does get to be a bit ridiculous! Hello Tanya – I’m certain this could be processed in a hot water bath, but I’ve never actually done it. Please let me know if you can this! I love condiments too! Salsas, mustards, tapenades… you name it and I want to try it. Stores like Dean & Deluca can be disastrous for the wallet :). 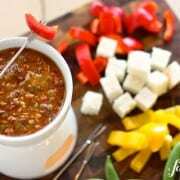 Love this relish idea and your suggestion to pair it with Mexican food is perfect! Thanks, Laura. Ahhhh…Dean & Deluca…reminds me of our trip to NYC many years ago. What a great store.